The need for such cosmetic products also arises when a person has lost weight, when the hated pounds have already left, and the skin has not had time to take new contours and is still flabby. You can get the ready-made masks of factory production but they mostly contain synthetic elements, whereas when using natural components, the tightening effect is achieved much faster and the skin is saturated with useful substances. In addition, ready masks can often cause allergic reactions and irritations on the skin. Here there are a few masks for the body, which are natural and can be effectively applied at home. Lifting products prepared at home are not addictive. They can be used not only for tightening the skin, but also for preventive purposes. If you start taking care of keeping your youth in advance, signs of aging will not soon appear on your body. To preserve the natural beauty of your body for a long time, it is necessary to take care of it daily, including not only cleansers, but also moisturizing and nutritious masks and creams in daily care. Natural body masks will make the skin smooth, soft, supple and taut. 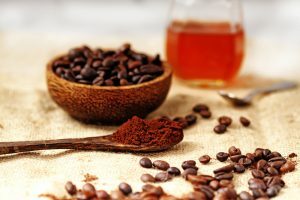 Coffee is an excellent tightener and can be used as a mask, scrub or anti-cellulite wrap. Coffee beans are a source of excellent caffeine, which allows you to quickly bring the skin into tone and has an invigorating effect. In addition, this ingredient is suitable for any skin type. To prepare a miracle composition at home, you will need the following ingredients. 30 g of fine sea salt. Add a little water to get a creamy condition. And then apply it evenly to a damp body. It is necessary to have the mask for half an hour, and after washing off the mixture with water at room temperature soak the skin with a terry towel. It is good to steam the flakes in hot water and mix with coffee in approximately equal proportions. Apply on the skin for about 15 minutes massaging it, as the mask works great as a scrub, cleansing the skin of dead scales. Leave the mask on for 15 minutes, rinse with warm water. You will feel how in a short time the skin becomes softer and smoother. How to make a mask: Thoroughly and gently mix all the ingredients until smooth. Apply the mask with massage, circular motions. Hold for 20 minutes, rinse with warm water. After the mask, a cool contrast shower is recommended. Important: The use of coffee in the creation of body care products has a tremendous impact on the skin. Caffeine, easily penetrating through the pores, splits fat in the most problematic parts of the body. In addition, it gives the skin a tan effect, and the unmatched fragrance turns any procedure into a pleasant pastime. 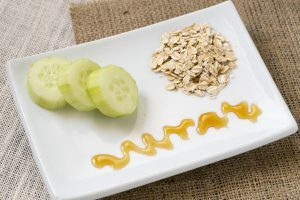 Oat flakes are considered one of the favorite means of Hollywood stars, which has a beneficial effect on the skin. They help to cleanse the skin, restore its elasticity and softness, and also successfully fight with fine wrinkles. Oat flakes – 1 glass. after add sugar and oatmeal. Finally put the honey and carefully mix the mixture. If the resulting composition seems to you a bit thick, you can dilute it by adding a small amount of milk. The composition is applied to warm, steam-heated skin with active massaging movements. The exposure time of the mask is 20 minutes. Important: After the mixture must be washed off with water. Apply a nutritious cream for body. A mask for a body from a potato starch can be used by any woman. Especially very useful for women who have reached the age of 35. 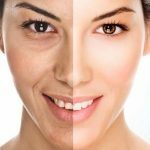 Also, it will be useful for those who want to tighten the skin of the body, which has lost its tightness as a result of a sharp weight loss.A mask of starch is used both in adulthood and in young age to prevent premature aging. Starch is recommended to use if you have: flabby skin; sensitive, thin or dry skin (will become softer and velvety, radiant health). Starch is rich in such useful substances: potassium (relieves the skin of dryness); carbohydrates (nutrition, energy); iron (affects the blood supply, nourishes the skin); vitamin B4 (controls the work of the sebaceous glands); vitamin C (stimulates the formation of collagen, rejuvenates and soothes the skin, levels its color, protects from sunlight). then add another 500 ml. The mass should be boiled until it thickens. Remove from the plate, add 5 tbsp. of the freshly squeezed carrot juice and 1 tbsp. of sour cream. Application: after cooling the mixture of starch, divide it into 3 parts. The first, until it is cold, put on the skin of the problematic zone for half an hour, the remaining parts can be used tomorrow and the day after tomorrow (keep in the refrigerator). Do not peel it before cooking. After cooking, the peel should be removed and butter (olive oil, for example) can be added with cream (bold) in such quantity that the mashed puree is obtained. It is possible, and even desirable, to whip the mass with a mixer (manually it will be very dreary). Application: apply the mix to the body and wait until the mask with the starch is dried. Then, the next layer is smeared, which must be whipped again before application. If you have a little more mixture, you can apply the third layer. It is necessary to wash the mass under the shower. After a session with a potato starch mask and taking a shower it is not recommended to rub the body with a towel. It should remain in a state of rest, therefore it is necessary to dry a body simply by wetting it with a towel. To make the starch-honey lifting mask mix 10 g of potato starch with the same amount of milk and honey. Apply the prepared mass to the problematic zones of your body and leave for 20 minutes. The mask is washed off with cool water without soap. Important: After the mask, lie down for half an hour on the bed without clothes. After 3 similar procedures, done twice a week, you will already feel how skinny the body has become. 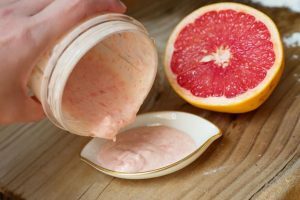 Grind one grapefruit together with the peel using a blender, do the same with the half of the pulp of the grapefruit, the pulp of one banana and half a glass of oat flakes. Then add three tablespoons of wine and olive oil to the resulting mass. Apply a mask with energetic movements on the body, massage for ten minutes, then let the mask remain for five minutes so that it is absorbed into the skin, and then rinse with cool water. Important: Don’t wipe after a shower, only slightly pat body with the towel. Cosmetic clay is very often added to body mask formulations, as it helps to remove excess fluid from the body, nourish and increase the elasticity of the skin, and also fight against cellulite. Masks with clay are warmed to room temperature and applied to the body. To obtain the maximum effect, the mask is supplemented with a wrap (film or dense tissue). However, the wraps are carried out in ten procedures at an interval of a month. Different types of cosmetic clay can be purchased at any pharmacy. It is recommended to add natural ingredients to get the best possible lifting effect. Here you will find variations of preparing effective masks on the basis of clay. add 300 g of pink clay and two tablespoons of liquid honey. Apply on the skin and keep no more than an hour. add 50 g of liquid honey. Put the mixture on the entire body for fifteen minutes. Combine 100 g of any cosmetic clay with three drops of orange oil and add three tablespoons of cinnamon. Apply the mask for twenty minutes. add two tablespoons of chopped dried kelp and five drops of lemon oil. Apply the mask to the body, paying attention to problem areas, and leave for forty minutes. 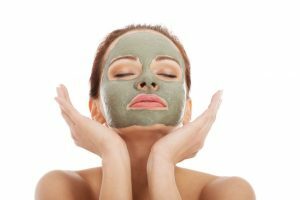 Important: The masks based on clay not only nourishes and moisturizes the skin, but also helps to reduce the fat deposits if applied regularly. Lifting procedures made at home have a lot of advantages. They aren’t worse than those you can make at a salon. Consider the advantages of home methods of rejuvenation. Long period of action. Home lifting does not act immediately, its effect can be observed only after 2-3 months of regular procedures. But the result is saved for a long time. The skin will be taut and fresh for several months, which some salon procedures can not guarantee. Lack of preparation phase. Usually, a cream or mask is used to tighten the skin at home. None of these means requires complex preliminary preparation of the epidermis. No side effects. If all the recommendations for use are met and there is no individual intolerance to the components, the mask and cream do not cause irritation to the face and neck. There is not even swelling and redness, peculiar to the hardware and chemical salon techniques of rejuvenation. The procedures that are carried out at home are always very convenient. Being in the walls of her own home, the woman is completely relaxed, which can not but affect the state of her appearance. Money saving. A cream, mask or other cosmetic with a tightening effect will cost much less than one salon care procedure. At home, all masks are for free as you don’t need to pay anyone.